Any sentence that includes “Miles Austin” and “hamstring” should be met with apprehension. Hamstring pulls have robbed Austin of both games and explosiveness dating back to 2011. The Dallas Cowboys say the latest one isn’t serious. Excuse us for our suspicions. Thursday marked the second consecutive day the wide receiver was held out of practice after injuring his hamstring in Sunday’s blowout win over the St. Louis Rams. Will Austin play Sunday against the San Diego Chargers? Will he be at risk to aggravate the injury if he does? It’s a script that’s become too familiar in recent years. Why do you love football? 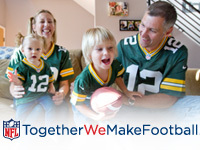 Share your story and you could win a VIP Super Bowl XLVIII trip. 3. Tampa Bay Buccaneers wide receivers Vincent Jackson (ribs) and Mike Williams (groin) both sat out their second straight day of practice. Mike Glennon‘s NFL debut is not going to be pretty if he has nobody to throw to. 4. Oakland Raiders quarterback Terrelle Pryor returned to practice Thursday, his first since suffering a concussion Monday night. The next step in the league’s concussion protocol is practicing in full pads. Matt Flynn has been taking first-team reps.
6. Baltimore Ravens running back Ray Rice practiced for the second straight day. NFL Media’s Albert Breer reported that internally, the team doesn’t view Rice’s hip injury is serious. It’s more about pain management for the All-Pro. 7. Miami Dolphins defensive end Cameron Wake (knee) has not been ruled out for Sunday night’s tilt with the New Orleans Saints. Coach Joe Philbin told reporters that Wake’s status will be determined late in the week. Dallas Cowboys DE DeMarcus Ware (back), LB Bruce Carter (foot) and CB Morris Claiborne (shoulder) fully participated in practice Friday, Oct. 4, and are listed as probable for Week 5. Dallas Cowboys WR Dwayne Harris (hip) and DE George Selvie (concussion) were limited during practice Friday, Oct. 4, and are listed as questionable for Week 5.